If you ask, I’ll tell you that I don’t like breakfast. That given the opportunity, I will choose lunch over breakfast eight times out of 10. But what I actually mean is: I mostly just don’t like breakfast’s attributes, like the bad (early) timing of the meal, the general shovel-rush involved and breakfast’s propensity for empty, sugar-laden calories that are quick to spike — and quick to plummet. I need protein, I need dairy, I need fiber that doesn’t come in a nasty, powdered mix or meal supplement like Muscle Milk. It’s early and I’m cranky and yes, the food has also gotta look good. When you turn the yogurt upside down into a bowl, the fruit-on-the-bottom becomes the fruit on the top, a pink, strawberry-flecked glaze. Add to that a couple of shakes of granola, dotted with nuts and dried fruit, and, instant success. Beautiful, and, more importantly, good for you: A Liberté Méditerranée strawberry yogurt and a serving of Bear Naked‘s fruit and nut granola collectively pack 2g fiber, 9g protein and 20% calcium into just 490 calories. Now that’s breakfast. Part of foraging for food in the modern world is trying new products, like this La Yogurt “blended lowfat yogurt” (not sure what that means). Given the shape of the container, and the suggestively French name, my first impression is that the yogurt is sort of a Yoplait copy-cat, aimed at the same demographic buying mid-range grocery store yogurts. One thing it certainly is not is French: La Yogurt is made by Johanna Foods out of Flemington, NJ. After you’ve fallen for Greek yogurt, nearly every other type of yogurt tastes a little bit like mush. But La Yogurt, in particular, feels almost gelatinous on the tongue, and, wait, is there … do I detect … Yes, every bite of this raspberry yogurt ends with a faint aftertaste of aspartame. I didn’t believe that granola expires (this little package has a Sept 2007 expiration date), but apparently it does. 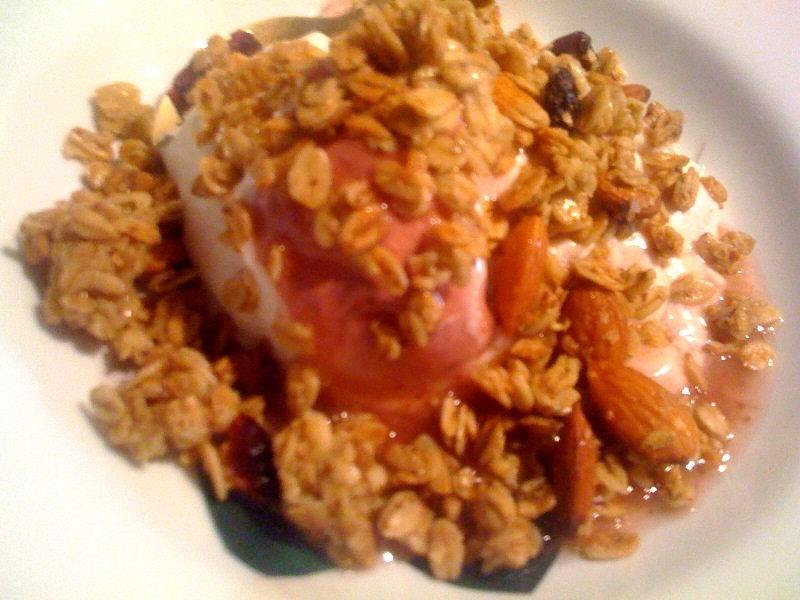 A year-and-a-half past optimal eating conditions, the granola and contents were stale in that soft, a-little-mushy way. Really, not so good. 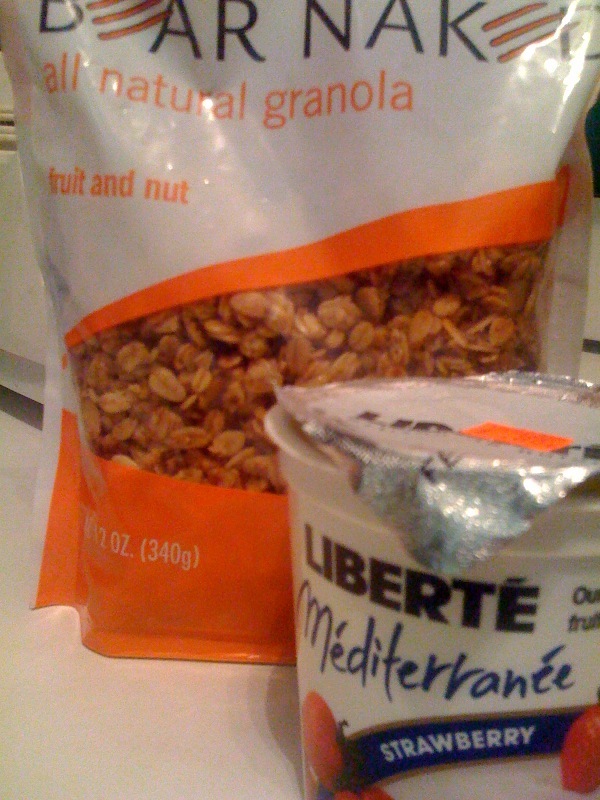 I ate a few pieces until I was convinced it was true, that granola actually can expire, then finally stopped. 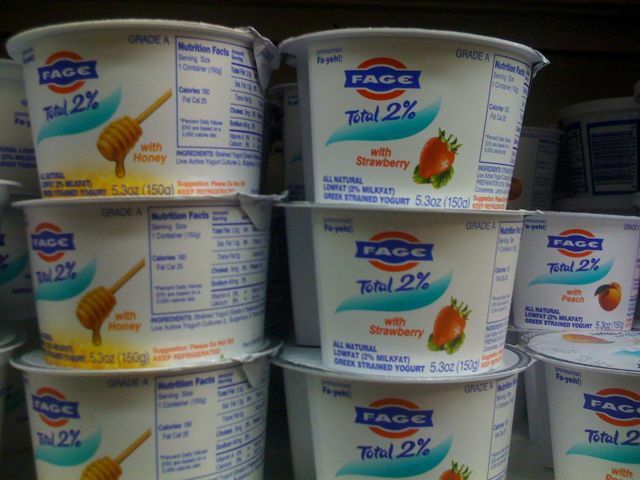 I turned to trusty backup, Fage 2% Greek yogurt with jammy mix-in, this time peach, which didn’t expire until sometime in June. As in 2009. Best of breakfast plans foiled! Was going to go for classy eggs, but Dean & Deluca’s breakfast grill closes at 10a… On the other hand I could have purchased an overpriced, meatless Caesar salad at 10:45a. Instead I’m opting for one of my standbys, the question being, which to choose?